Oh wow, you remember Beck, right? That guy from Mighty No. 9? He's back—but not in the way you'd expect. Beck and Gunvolt (of Azure Striker Gunvolt) are slated star in Mighty Gunvolt Burst; a direct follow-up to 2014's retro-inspired Mighty Gunvolt. 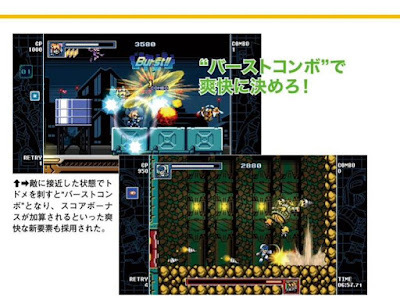 According to this week's Famitsu issue, Mighty Gunvolt Burst will feature a character growth elements and a system that awards up-close enemy kills dubbed "Bursts." The game is slated to hit Nintendo 3DS and Nintendo Switch. The Switch version will include HD rumble for "dousing". More details are expected to be unveiled at Inti Creates' BitSummit panel this weekend. In the meantime, please enjoy the above tiny screenshots. That statement is ignorant as all hell. By the way, that isn't how you use a semicolon. Semicolons must go in between two closely related independent clauses. The single word "sprites" isn't an independent clause. You should have used a colon. While a colon must be preceded by an independent clause, it doesn't necessarily need to be followed by one. You also forgot the damn period. Well excuse me GrammarMan. Sorry my post triggered you. Taking to the streets of RMC to educate people about the proper use of punctuation, I see. Agreed! The games should be sprite based. Especially higher quality sprite based like X4, X5, & X6. Anon 1 has every right to correct VileMKII's ignorance in both cases, Anon 2. This whiny sprites only attitude is why Mega Man never evolved after MM8. People need to quit it with that crap. Why does everyone want classic Mega Man to stay in his robot cradle, forever confined by the limits of 8-bit graphics? It's absurd and illogical thinking, and it needs to stop right now. As for punctuation, it's always important to get that right. Would you write your resumés like that? Yeah, didn't think so. I agree that the statement is very ignorant, but I wonder if Anon #1 took into account the possibility that the original poster might have simply mistyped the semicolon before going on his grammatical rant. @Anon3: How is Anon2 impeding the rights of Anon1 in anyway? Also if some of you want to be literate police here, you should stop using the word ignorant in place of stupidity. If you are using the word to mean rudeness, your sensitive butts shouldn't be able to handle the web, because few points in time or place should that comment constitute being rude and generally wouldn't in internet culture. Otherwise, there is no evidence in VileMKII's comment that supports any lack of knowledge or worldliness, outside of possibly the misuse of punctuation. VileMKII's comment is just a disagreeable assertion. Well, I think that both sides have valid points. It would be nice if Megaman could have a successful outing without the sprites but so far the attempts have fallen flat. Its alot easier to make good side scrolling platformers like we've seen before with sprites. I don't know what you are wanting for a new game anon 3, but I just don't want them to mess it up. Last I checked this was a blog comment section, not a resume. Is my statement ignorant? Nay. The line of playforming Megaman game that are in 3D have various mechanic flaws. Wall jump dashing was no where near as effective as it was in the sprites games. Powered up showed us how the 3d affected overall sizing. The screens in stages were incredibly smaller. Dashing and Sliding in both games felt slower and shorter than the sprite distance and that is likely due to screen and stage sizes. Do you agree with these? Maybe, maybe not. These are my reasons to prefer sprited games. Just to pitch in my two cents, I think Mighty No. 9's issue wasn't the fact it used 3D graphics. The real issue was that those graphics weren't very well-made. They had no real artistic style, and the lighting and model quality made it feel like they were ripped from a mid-PS2 era title. There are plenty of fantastic games that have much better-looking 3D models out there. Granted, if Comcept doesn't have skilled modelers/animators, then a wise choice could very well be using sprites, but if they were to improve, I wouldn't mind them tackling a 2.D game again. Wasn't expecting Mighty Gunvolt to get a sequel; maybe this one'll be longer? Of coure I remember Beck, all the money I wasted on him! When are we the backers getting our promised rewards? I know I was scammed, But I'd like it a lot better if they just forgot MN9 existed, instead of getting Beck more exposure in other games before fulfilling their kickstarter promises! What about those who already have Mighty Gunvolt for 3DS? Do we need to transfer, start over, or buy the new one? I'm pretty sure this new game is a sequel, not an update. So you would need to buy the new one. Well that's nice. I had more fun with Mighty Gunvolt than either of the respective main games. Maybe after this game Comcept finally will get their heads out of the sand. Same here I thought Might Gunvolt was a lot better than the main games themselves. Oh good. I should commence holding my breath for Mighty No 9 to hit the 3DS! No, no... This is pretty much what I was expecting to happen to Beck. Ugh... I just wish MN9 stops getting brought up and just fade away and don't remind us of the train wreck that it was. Meh, the first game wasn't even that great. It was pretty mediocre. And this is coming from someone who loves old school 2D platformer games. I'll pass. This should be a free perk to anybody who backed that cursed Mighty No. 9 game and didn't get their rewards. why not. if i get my hands on it, i'll play it. will not go out of my way to get it, though. Say what you will about Comcept and Intercept, but no matter what you say, for giving me MMZ-4 MMZX&MMZXA and heck even Gunvolt to a certain degree. damn, i had forgotten he was called Beck. i tend to call him "mighty n°9" or "the guy in mighty n°9"